Surface decorations in clay pieces include incising, carving, fluting, and faceting. 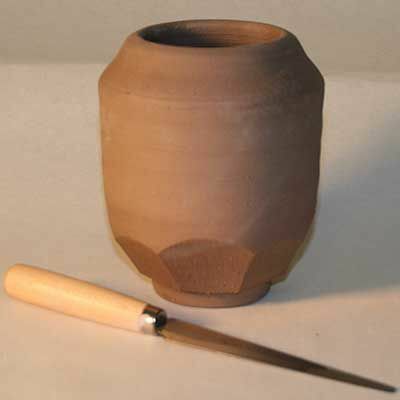 Used by themselves or in conjunction with other decorative techniques such as glazing, these offer a wealth of possibility in creative clay work. To facet a pot, you will want the pot to be at the medium leather-hard stage. Use a sturdy knife, such as a hard fettling knife. Support the area below the area to be removed, either with your hand directly if using a dull blade, such as a fettling knife or with a piece of wood if using a sharper blade. This support will help keep the end of the cut clean, with no ragged tear-aways. When creating fairly large facets, grip the knife blade at both ends to help keep the knife steady and moving smoothly. For even facets around the pot, cut the first one, then turn the pot 180 degrees, cut the next facet at the same angle, turn the pot 90 degrees, cut the next facet, turn the pot 180 degrees to cut the fourth facet, and so on. Fluting pottery means to cut narrow vertical grooves into the pot. It is another method of creating surface decoration and interest. Fluting, as with all these techniques, can either be done very precisely, almost mechanically, or it can be done in a much more free-form style. As with all decorative techniques, fluting can also be used in conjunction with other techniques. In the photo you see a pot which was faceted, then flutes carved down through the middle of the facets. Although fluting can be done with a very fine tool, in this case, the flutes were carved freehand into the leather-hard clay with a ribbon tool. Carving stiff leather-hard clay can be used to decorate pottery as well as to create sculptures. In this case, the carving is being done to a lump of clay which will be carved into a cup complete with a face on the side. There are a plethora of carving tools; some made specifically for clay work and others you may make or adapt for your purposes. Sharp knives are helpful in removing large areas quickly. Ribbon and loop tools can remove and begin shaping sections. Dental tools and other fine tools can be used for detail work. One of the most overlooked carving tools is the brush. Used dry, it can help clear dust from areas, thereby allowing you to see your project better. However, it is when brushes are wet with water that they come into their own. A wet brush can remove clay in smooth, lyrical lines. Also, they also can be used to smooth any carving marks left behind by other tools. Clay can be incised to create pottery decorations. Various incising tools will give differing incised lines. Tools vary from old pencils to steel tools made just for potters. Try out a variety of tools and pointed objects to find the ones that you like best. Incised work can be done when the clay is wet, for softer lines, or at medium to stiff leather-hard for sharper-edged lines. Do not attempt to brush away any curls or fragments of clay; they will tend to weld back onto the clay surface. Instead, either use a soft, dry brush to flick them away or wait until the pot is bone dry, at which point they are easy to dust off.